Back in 2008, while on a business trip to Angola in West Africa. I was invited for lunch by the locals in the office. On our way back from the canteen, I noticed most of the expats were carrying their leftovers with them and I inquired one of them as to why. He said, "you'll see". I soon found out that the children from a nearby slum would come everyday at lunch time. 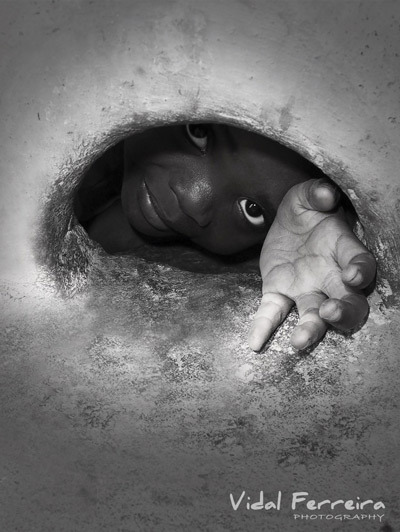 They would stick their tiny-little hands through the water drainage holes on the wall, separating the compound from a raw sewage stream coming from the slum, and yell at the top of their lungs: “Tio, Tio…” ("uncle, uncle" in Portuguese) begging for food. I managed to snap this photo while handing over a piece of bread and a can of soda to one of them. This shot made me fall in love for the power of freezing a moment. I hope you feel as touched as I was. I call this shot “Life Changing” for a reason.